Hi everyone, it’s my first go to see at this site, and piece of writing is genuinely fruitful for me, keep up posting these types of articles or reviews. How can I get this book in the USA ? The shipping costs on Asia Books are exorbitant. Is there an ebook version available? Thanks. Thank you for your interesting in this book. Right now, there is no distribution channel in USA. I will try to see what we can do. But we can not do the ebook because we give all the right to publisher. Unless the publisher decided to organize this ebook by themselves. I just contact Ajhan Sumano about your question. He told me that if you can come to visit him at the cave, he will give you free copy of this book. 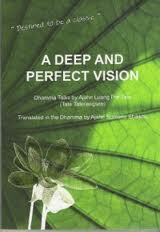 Have tried to get a copy of A deep and perfect vision on my Kindle but it does not seem to be available, any suggestions? I am attending suan mokh on the 1st of August, was wondering if can visit Ajahn Sumano Bhikku?